This building’s facade was extravagant, with 17 archways looking onto the street from the second and third storeys, columns and balconies, carved eagles, and a dizzying assortment of shells and other ornamentation. Clearly, it had once been a special place – but today it’s a shadow of its former self. Keen to know what I was dealing with, I went into JB HiFi and had a stickybeak around. Lifting my eyes above the displays of One Direction and Breaking Bad I could see a high, vaulted roof, more archways, and elegant cast ironwork. Clearly, this was no private house. The realisation dawned on me: it was a former shopping arcade. Like a flaneur – one of those dilettante wanderers of the 19th century – I strolled along the aisles, craning my neck upwards, bumping into display boxes every few steps, trying to picture what used to be here. High up, on one of the inside windows, a faded, dusty man in the moon smiles down at the shoppers, unnoticed by practically all. Is he a surviving relic of the building’s Victorian origins, or a more recent addition? Did he peek into the oyster saloon, or spy on users of the Turkish bath? These days, Chapel Street is a pretty interesting mix, where New Age crystal vendors rub shoulders with boutiques, op shops, bars, second-hand bookshops, arts spaces and vintage dealers. But for many years it was a centre of mainstream retail to rival Bourke Street. Large department stores – The Big Store, Love and Lewis, and Read’s furniture and drapery – still proudly proclaim their names to passing pedestrians although the retailers that bore those names have long gone. “To swing a bicycle down the pulsing canyon of Chapel Street was to discover the heady delights of metropolitan glamour,” wrote Graham McInnes in his autobiographical The Road to Gundagai. But before there were department stores, there were arcades. Melbourne was not immune to the international craze, though we got into it a bit late. Ever since the Great Exhibition of 1880 – for which the Royal Exhibition Building was built – middle-class Melburnians had displayed a voracious appetite for luxury goods, especially when imported. Only a handful of arcades survive in Victoria, the finest of which are the Block Arcade (built around the same time) and Royal Arcade in the CBD. But a few were built in the suburbs as well – and of these, the most significant was the Prahran Arcade. The Prahran Arcade, around 1890. Photo: Charles Rudd. Source: State Library of Victoria. The architectural style which had struck me on first glance – those columns! The ornamentation! The statues! The eagles! – is known as Second Empire, popular in France during Napoleon III’s rule (1852-70). Paris was the epitome of the sophisticated shopping city, the centre of luxury and fashion, and its arcades were a marvel: so it was fitting that this flamboyant style was chosen by Melbourne architect George McMullen when he designed an arcade intended to rival those of Paris, London and New York. The photograph above, taken early in the building’s career, shows that it used to have a mansard roof with towers, which would have added even further to the visual impact. At some stage, though, it was scalped. There also used to be some intriguing sculpted figures on either side of the front door. If they are still there today, they are hidden behind JB’s signage. I don’t have any photos of what the Prahran Arcade looked like inside in 1890, alas. Perhaps it was meant to resemble Royal Arcade, but even bigger and better. Royal Arcade, Melbourne – an arcade that still prospers today. The building’s opening on 31 July 1890 was celebrated with a banquet organised by the owner, Mrs Elizabeth Delaney. The original occupants included around 30 shops and a Turkish baths, billiard rooms, a restaurant, an oyster saloon (surely it’s time they made a comeback?) and the splendid Arcade Club Hotel. But the timing was poor. In 1890, Melbourne was entering a prolonged recession, brought about by rampant property speculation during the previous decade. Banks closed, businesses went to the wall, unemployment spiralled. Within a year, Mrs Delaney had lost control of the arcade, whose ownership passed to The Caledonian and Australian Finance Agency. The architect, George McMullen – hitherto successful and prolific – was named insolvent. Thereafter, the arcade took on a different life to the one imagined by its creators. During the early 20th century it was occupied by organisations such as the Theosophical Society, the Independent Workers’ Union and the Melbourne and Suburban Fuel Men’s Association. In the 1920s, renamed The Centreway – a name still visible in an entrance mosaic as you walk in – the arcade was home to the Centreway Disposals Co, Eterna Shirts and Blue Jay Manufacturing. By that time, the era of arcades had passed, and department stores were the new big thing. A photograph of the interior of the arcade taken in the 1950s shows it as a rather lonely, depressing place. In the 1960s the arcade became Dan Murphys, which occupied the whole ground floor for several decades. This was in the days when Dan Murphy actually ran the place himself, in the process teaching a generation of Melburnians about wine. According to the signage, there were’personal observers keeping constant watch’ for shoplifters. I imagine sharp-faced men in trenchcoats lurking behind those upper arches. In the 1980s, the National Trust carried out a survey of the building – which is when the photos below were taken, showing the romantic, faded baroque stylings of the upper storeys. The Prahran Arcade was later renamed Centreway. In the 1970s-90s, the upper storeys of the arcade took on another lease of life as the home of artists and musicians. Howard Arkley, the great documenter of Melbourne suburbia, had a studio here, in a building as architecturally different as could be imagined from the humble suburban houses he immortalised in his work. The Birdland recording studio, run by Lindsay Gravina, operated here in the 1990s, from which many classics of Australian rock music emerged by the likes of Eskimo Joe, Spiderbait and Magic Dirt. 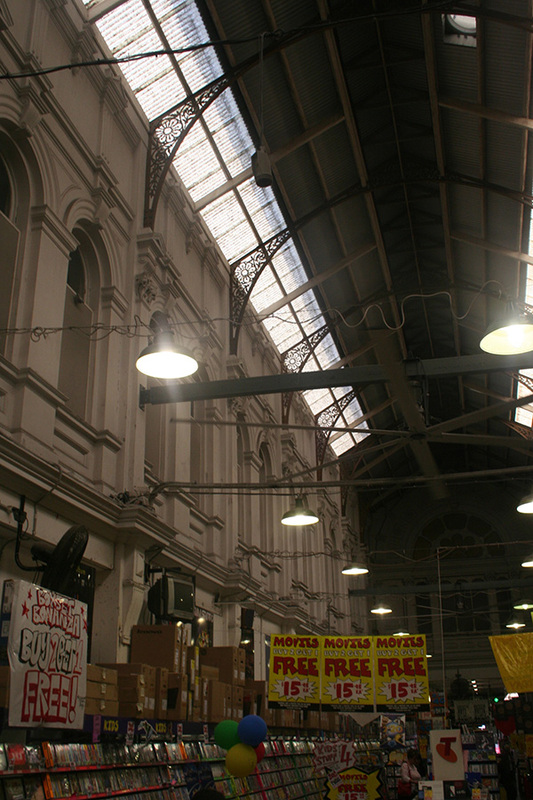 The conservation officer of the National Trust, Rohan Storey, concluded the assessment of the building with: “The Prahran Arcade is one of the three most significant arcades in Victoria, and probably the second most architecturally significant” – after The Block Arcade. However, it was never very successful as an arcade, which is perhaps to be regretted, although for some years it did play an important part in suburban life as the home of retailers, community organisations and artists of various stripes. It seems unlikely that the Prahran Arcade will rise again in the near future. But it still retains its capacity to astonish. And who knows, perhaps one day the small shops will return, and the arcade will once again echo with the feet of flaneurs strolling from Turkish bath to oyster saloon. Update: I wandered past in October 2017 and saw that a number of lovely ghostsigns on one of the entrances have been uncovered and protected behind perspex. They give further insights into who occupied the arcade. I haven’t checked the dates when these people were in business – probably quite early in the arcade’s history – but it shouldn’t be too hard to find out if anyone is so inclined. Many thanks to the National Trust of Australia (Victoria) for their assistance with this story. Map of the whole walk so far on Google Maps. I remember this building with its striking arches from a wander up Chapel Street last year – so interesting to read more about it here. It looks in a bit of a sorry state, as does much of that area, which struck me as odd given the wealth in that part of Melbourne. Nick – gorgeous writing on a building I adore – there are a couple of pictures on Picture Australia of the actual Arcade shops. It COULD be brought back to its original glory!! Terrific research. Prahran Arcade is best remembered by me as being ‘Dan’s’ and it worked quite well for that purpose with each of the side areas having certain types of drink. To my shame I have never noticed the Centreway. I believe in the 90s and perhaps later there were artists living up top behind the balconies and being seen out on the balconies. Reads is of course now known as Pran(sic) Central but for most of its early life was known as Moore’s Corner Store. My great grandparents would shop there weekly, coming in from their farm where Monash Uni now is. In early days it was by horse and carriage and then later and oddly, he on his own in his car with his wife and whatever children that needed clothing and footwear still in the horse powered carriage. While I don’t mind the distressed state of Prahran Arcade, it would be nice to see the building restored. I believe Howard Arkley had a studio in Prahran but I don’t know where. I used to see him around when I was an art student at Prahran CAE 1974-78. This arcade was incredible, like stepping into another world. Great piece of writing, Nick. Nice to learn a bit more of the building that had me gobsmacked by its beauty when I ventured down Chapel St a while back. Sounds like something I would say – I do like extravagant late Victoriana, and this is one if the best! The interior not so ornate, but grandly scaled. I think it was doomed to failure, since unlike city arcades, it didn’t lead anywhere, so no through traffic, and there were plenty of small shops and later department stores on Chapel street to lure shoppers. So it ended up low rent and not much retail. And of course, the great 1890s crash didn’t help. Yes, I have become more sympathetic to bonkers late Victoriana than I used to be! This is indeed a classic. Good point about the lack of through traffic – there was really nowhere to go when you got to the back (and there still isn’t, unless you jump into the public swimming pool). A really fascinating article, of special interest to me because of the Turkish baths. What a pity there are no extant images of the interior of the arcade as it was when it opened. However, there is another great image of the outside which must have been taken around the same time as the photo by Charles Rudd (and which may, of course also have been by him). This also shows the building still with its mansard roof, though the horse (with the parked trap) is a different one. But its special interest for me is the banner hanging over the entrance advertising the Turkish baths. Nothing is so far known about the Turkish baths, but they must have been of a reasonable size as we learn from the banner that hot and cold slipper baths were also available. I tried to upload the image to my comment but this was not possible. However, it can be seen (http://tinyurl.com/hgbcusb) courtesy of Stonningtron History Centre, as one of the Pictures of the Month on my Victorian Turkish Baths website. We know of ten other Turkish baths which were open in Melbourne at some time between the first in Lonsdale Street in 1860 and the closing of the one in the City Baths in 1983. One of these was at the south end of the Royal Arcade, also mentioned in your article. This opened in 1870 and closed in 1929 when its boilers burst and flooded the arcade and the surrounding area. There do not appear to be any remaining Victorian or Victorian-style Turkish baths in Australia today though we are fortunate that there are still twelve in the UK (http://tinyurl.com/pfncgsv), with hopes of restoring and re-opening three others in the not to distant future. Fabulous! Many thanks for the link to the photo with the Turkish baths banner. In which part of the arcade do you think the baths would have been located? Great timing. My wife and I were only wandering in there about 2 weeks ago. We chatted with one of the JB shop assistants about the place. At the time I noticed a metal grate with glass bricks in the floor that had “Collins St” cast into it. Clearly, it reminded me of the ones in the CBD, to which the shop assistant said she’s seen lights from below. A basement in there perhaps?? She did say that there were studios upstairs too. It’s a fascinating building. I worked in the wine and spirit trade in the 1970s and often called here on business. It was a ‘Dan Murphy’s’ – it was THE Dan Murphy’s – with Dan working who business at this place. It was Woolworths who have turned Dan Murphy away from the wine expert person into a ‘Brand’! This place should be recognised for his presence too. Thanks for the correction Les, that’s a good point. Great, thanks for sharing those memories Paul. The upper level of prahran arcade Is now the home of artist david bromley, who also has a store in the old pattersons cakes shop down the windsor end of chapel st.
My great Grand father and Great Grand mother were married some where in the arcade in 1897. The wedding certificate called it “The Y Arcade Prahran”. I must come and have a look at what is left of the Arcade. I dreamt of the arcade last night. Looked it up today. Thanks for researching it. Great photos. In the 1960s there were shops in the arcade. At least one cafe. I used to go there after ballet lessons at the National Theatre, which had studios in a side street off Chapel Street. Very interesting and very informative. In Sydney’s North West, we had the Riverstone Arcade foundation stone laid, by a Mr. GEORGE AUGUSTUS SALA. Daily Telegrapn (London) global travelling foreign correspondent. George spent over 10 months of his life in Australia and New Zealand. George used the phrase, “Melbourne the Marvellous!” This quote has been compressed to “Marvellous Melbourne”, still in use today some 133 years later! The Riverstone Arcade and Turkish baths were used by NSW Gold Prospectors returning from the NSW Gold fields of Hill End, Sofala and Ophir. These unlucky miners were filthy from months of prospecting. They avoided the Tolls of the Great Western Highway by travelling on the Bell’s Line of Road (no toll). Tragically in 1892, a Global Financal Crisis occurred. The Arcade became unprofitable for the Intercolonial Land and Building company. The return of this asset fell below the 5 to 7.5% nett dividend return expected. The asset was broken up and sold.